This post aims to present what frameworks are and what they are used for, alongside a selection of the best that can be got for free on the internet. In this way, we want to help web designers and developers who are starting out to discover new resources and possibilities, as well as setting out concepts that can sometimes be too abstract for those who have already travelled far in the world of web design. Most websites share a very similar (not to say identical) structure. The aim of frameworks is to provide a common structure so that developers don’t have to redo it from scratch and can reuse the code provided. In this way, frameworks allow us to cut out much of the work and save a lot of time. To summarize: there’s no need to reinvent the wheel. How many types of framework are there? There are basically 2 types to differentiate: backend and frontend (this distinction is drawn depending on whether the framework is for the presentation layer or the application/ logical layer. It’s important to understand that frameworks are a conceptual notion: a pre-prepared standard kit from which to work. 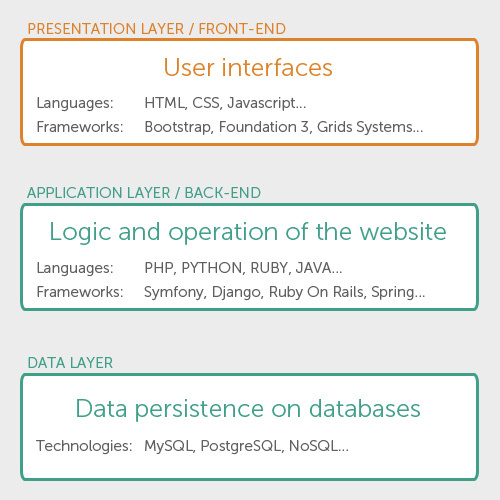 The concept of a framework can be applied to different processes carried out on the web: the programmer’s layer which connects the database to the site content and uses PHP language, and the designer’s layer, where that content must be presented in HTML documents with defined CSS style sheets so it can ultimately be viewed in a browser. They can be backend (a set of files with libraries to access databases, template structures, session management) or frontend. We’re going to focus on frontend frameworks. CSS source code to create a grid: this allows the developer to position the different elements that make up the site design in a simple and versatile fashion. Typography style definitions for HTML elements. Solutions for cases of browser incompatibility so the site displays correctly in all browsers. Creation of standard CSS classes which can be used to style advanced components of the user interface. About responsive frameworks: Currently the rise of responsive web design techniques, which facilitate the development of websites that can adapt to various resolutions for different mobile and desktop devices, is leading to the emergence of responsive frameworks. That is, they solved the common problem of making a responsive site. These frameworks...to offer a responsive solution from the point of installation. Within CSS frameworks, we can draw a distinction between two types of framework according to their complexity: simple frameworks and complete frameworks. This distinction is subjective, and doesn’t mean one is better than the others but rather that they give different solutions depending on the level of complexity and/ or flexibility required. These are often called simply “grid systems” but are frameworks nonetheless. They offer style sheets with column systems to facilitate the distribution of different elements according to the established design. Spectacularly Easy Responsive Design. Inspired by Ethan Marcotte's responsive web design, this site was set up in the spirit of giving something back. I found something that works for me, and I want to share it. Simple CSS framework for fast, intuitive development of responsive websites. Built using the 'Mobile First' approach, 'clearfix' for clearing floats, box-sizing: border-box for adding additional padding to elements, and weighs less then 1kb compressed. Responsive design isn't hard, you've just never used responsive.gs. Gridiculous was created after I tried out a bunch of different responsive grids and realized that none of them offered all of the features I required. Responsive grids for Compass. Susy is based on Natalie Downe's CSS Systems, made possible by Sass, and made easy with Compass. You can use it anywhere, from static sites to Django, Rails, Wordpress and more. It even comes packaged as part of Middleman, to make your life easy. They usually offer complete frameworks with configurable features like styled-typography, sets of forms, buttons, icons and other reusable components built to provide navigation, alerts, popovers, and more, images frames, HTML templates, custom settings, etc. Sleek, intuitive, and powerful front-end framework for faster and easier web development. Built at Twitter by @mdo and @fat, Bootstrap utilizes LESS CSS, is compiled via Node, and is managed through GitHub to help nerds do awesome stuff on the web. An advanced responsive front-end framework. Foundation 3 is built with Sass, a powerful CSS preprocessor, which allows us to much more quickly develop Foundation itself — and gives you new tools to quickly customize and build on top of Foundation. A Beautiful Boilerplate for Responsive, Mobile-Friendly Development. Skeleton is a small collection of CSS files that can help you rapidly develop sites that look beautiful at any size, be it a 17" laptop screen or an iPhone. 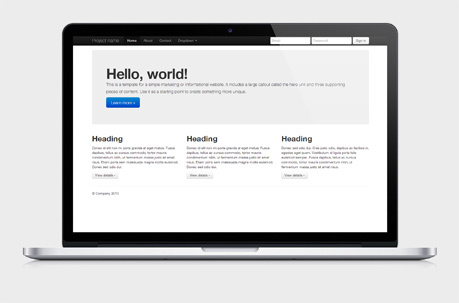 A modular CSS framework for truly flexible, accessible and responsive websites. YAML is tested and supported in major modern browsers like Chrome, Firefox, Opera, Safari and Internet Explorer. Gumby Framework is a responsive 960 grid CSS framework which includes multiple types of grids with different column variations which enables you to be flexible throughout an entire project's lifecycle. CSS-framework for professional developers. Minimal and enough. Adaptive and responsive. Revolution grid and beautiful typography. No imposed styles and freedom. GroundworkCSS has been built from the ground up with the incredibly powerful CSS preprocessor, Sass. 1. Every site is different and will require different characteristics. Using a very complete framework for a single page site may give an adequate result, but surely misses out on many resources. 2. Currently there aren’t many significant differences: they’re all very complete and easy to use. Speed of installation: some are very simple to install and start using. Others require more time to configure. Ease of understanding: some are a bit of a pain to get to grips with, complicated. Others, by contrast, are comparatively more straightforward. Options: some frameworks are more complex than others and offer more configuration options, widgets and interface options. These will allow you to do better things with your site. Best long-term support: Some digital projects lack continuity in time and updates and support services stop. It’s always better to opt for those that offer continued support guarantees. Many of them are supported by companies that offer other professional products on the market. Having a single procedure to resolve common problems makes maintaining various projects more straightforward. Is it advisable to use a framework? Not necessarily. The developer must take the final decision on whether or not to use a framework. This will depend on several of the issues we’ve looked at. Frameworks are a resource that can be extremely useful for many people, but that doesn’t mean they are necessarily useful for you. Now you know what they are, which ones are out there, and the advantages and disadvantages of using them.